RICHIES BIKE STORE opened its doors to the public in August 1995. Since then we have developed into one of Dublin’s premier cycle stores specialising in quality bicycles and accessories. We cater for all aspects of cyclists, whether it be a beginner leisure cyclist, or a pure thoroughbred racing cyclist we are your one stop cycle shop. Our staff is on hand from 10am to 6pm Monday to Saturday to serve you and offer you impartial advice whatever your query may be, to the best of our knowledge and ability. We pride ourselves on having the ability to pair each customer with the bicycle most suited to their everyday needs. We run a "same day" repair service which means you and your bicycle are off the road for minimal time. Small repairs are generally done on the spot to allow minimum inconvenience to customers. Bikes – we can advise on what will suit your needs. We offer a savings club, all year around. Simply pop into us and we will set up a savings scheme where you pay whatever you can each week. You can then use this against the cost of your bike when you are ready to purchase. Ideal for saving for birthdays, Christmas etc. Feel free to have a look around our website. If you have any questions at all, give us a call. Our friendly staff will be more than happy to help. 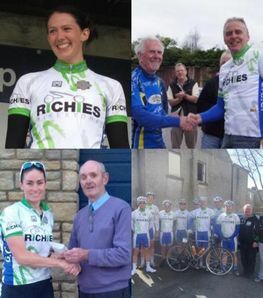 Richies Bike Store are proud sponsors of the Garda Cycling Club. 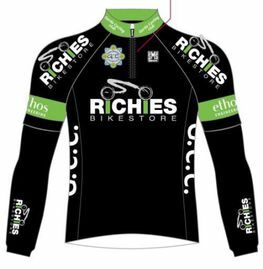 A full range of cycling gear can be purchased at our store. Payment Options: We accept Cash, Cheque, Credit Card & Laser/Debit Card.